Hello, my friends! 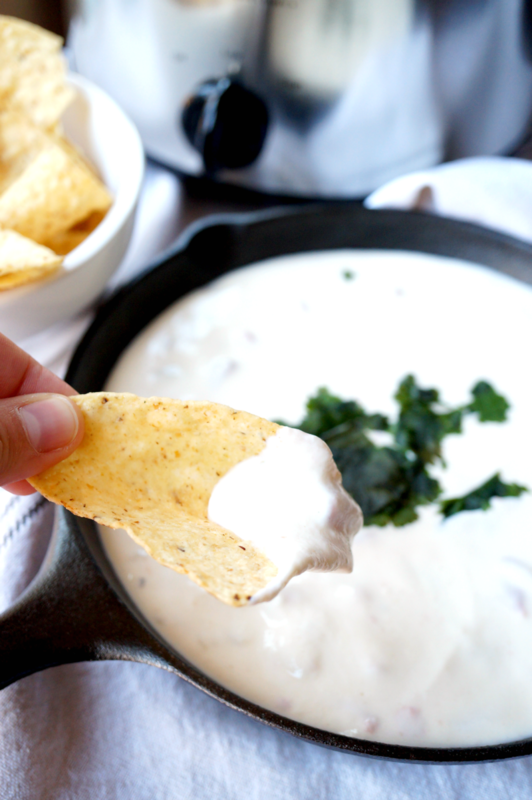 I am sharing some insanely easy, delicious white queso with y’all today! I was coerced into bringing queso to work by my colleagues, and I figured why not blog the recipe while I was at it? They requested restaurant style cheesy dip, and that’s what I tried to accomplish here! This 5-ingredient wonder is so simple to make, and the best part? NO Velveeta! To each his own, but I just can’t stomach that stuff. Anything that is half chemicals and is somehow shelf stable cheese “product” should probably not be consumed. But I digress. Queso! Made with real food! Let’s do it. 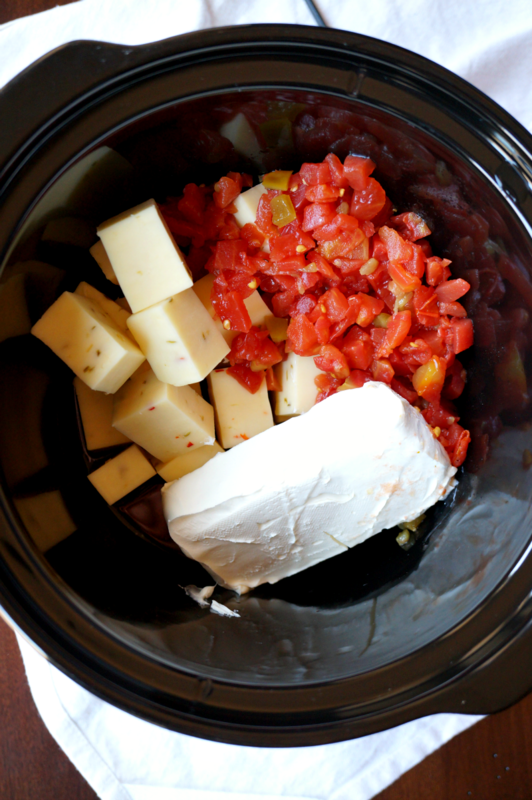 In a medium pot over LOW heat, combine the cheese, cream cheese, sour cream, and Rotel. Let the mixture heat until the cheeses melt and a smooth cream forms, stirring often. This should take 15-20 minutes. Add the spices if desired. Add milk if needed. Not sure why this recipe has only gotten 50% good ratings..? It was delish and super easy. I made it on the stove w a medium saucepan pan, heat on setting 2 of 9. I also covered it between the frequent stirring, I think that helps melt the cheeses. Seasonings were a must and I added cooked black beans for protein. Thank you so much for the great rating, Nikki! Seems like this queso is either something people love or hate. There’s no in-between. 😉 But I’m glad you liked it and the beans sound like a great addition! So glad I found this!! I just made a white queso for the super bowl party we had and it turned out a disaster. As soon as it started to cooled it turned into one big lump I think cream cheese would help it stay cheesy…if that makes sense. Oooooh so much cheesy goodness. This sounds amazing! I love how easy it is to make. Yum! Thanks for sharing. Your blog has stunning pictures (btw). Love it! Mmmm yummy!!! Just want to dive into this with a spoon, lol! This looks so amazing. Beautifully presented, but it also looks like it’d be DELICIOUS! I will definitely be trying it! Looks great, but there’s a goof: “let it do it’s thing” should be “its.” (“It’s” is a contraction for “it is.”) Hope that helps! Did it really matter how she said..rude!! I agree. Very rude. Who cares, it’s (its) a recipe not a term paper. I agree with Pamela and leelee. Did it really matter about the apostrophe!?!? That was just plain rude. Have you never made a mistake? This is a very good recipe to give people for a white queso not an exam in English 101 !! I disagree. I would want someone to let me know if I made a grammatical error. I understand it doesn’t matter to everyone but to some it really is important. And it was very respectfully pointed out. All that aside, I’m making this tomorrow and I’m very excited! It looks delicious! Thank you so much for sharing. Give me a break, what a control freak! This is Pinterest, not English class! The recipe sounds delicious and I cannot wait to add some chorizo to it in hopes for it to come close to the Chori Dip at my local Mexican restaurant. Some people need to relax and not feel the need to correct a strangers post on Pinterest, soooo annoying!! Cant wait to try! P.S. This is the first time I have commented on Pinterest due to complete annoyance! aw don’t be so picky. this isn`t English class now go ahead N PICK MINE APART TOO! Question: In your opening to the post, you mention that you threw everything in the crock pot and let it melt, but the instructions say to have it melt on the stove and then put it in the crock pot. Can you put it all in the crock pot first to melt, or will that not work? Thanks! Great recipe! It was a hit at our house and so easy, too! I did make it completely in the crockpot, since we were leaving and I wanted it ready when we returned. I put every thing in, turned it on low for 1.5 hrs and then turned it to warm while we grazed. Turned out perfect and creamy! I haven’t tried but I’m sure it would be delicious! I would cook the meat on the side and drain it before stirring it into the queso. Totally! Make taco beef, but don’t add salt. It’s like nachos every time you dip! I added ground turkey taco meat and it was amazing! I followed the recipe otherwise and took it to a party. Kids and adults alike went crazy for it! I did. I added lean ground beef with some taco seasoning, drained it, and added it when the cheese was mostly completely melted. This looks SO yummy! Has anyone tried using Greek yogurt instead of sour cream? I have the same question. Has anyone done this? Hello ladies! Great question. I personally have not tried it but I would guess it would be fine. Greek yogurt is used in place of sour cream in lots of recipes. My only concern would be potential curdling but I think as long as you watch the heat it should be okay! I did and it was great. Could you use heavy cream instead of milk? SUPER EASY!! Thanks for sharing! Hi! Definitely going to try to make this for our party next weekend! One question. Do you find it spicy? Just wondering. I don’t like too spicy, & with the pepper jack cheese & then the rotel m, just want to make sure it’s not too hot. Thanks!! Just made this and it is very thin and soup like. Has anyone else had this issue. I think the amount of milk on top on the undrained tomatoes may be too much liquid. Thoughts? Hi Alesha! I am sorry to hear that! When I made it it was very thick and I actually ended up adding more milk on top of what I listed so that you would be able to dip the chips. Did you use full-fat sour cream, cream cheese, etc? I know the low-fat alternatives can sometimes be a bit runny. I’m sorry it didn’t work out for you perfectly though! I would add that you should use the full fat version of the sour cream and cream cheese. I made it with low fat versions and the consistency was really lumpy and weird, like the sour cream may have curdled or something. Bummer. I think it would be really good otherwise. Thank you for your feedback! I have not tried making it with low fat dairy so I didn’t know it would do that. I’m sorry your queso did not turn out well 🙁 But I will definitely be adding that to the recipe! The recipe says drained Rotel. Not draining would add a lot of additional liquid. I’m guessing this was an oversight? Hi Julie! I have received mixed reviews about draining and not draining the Rotel so I would say it’s probably best to drain it and just add milk if the queso comes out too thick! The recipe does say drain the Rotel. I did not drain it and that made the consistency lumpy. Definitely drain the Rotel. I would also use a high quality pepper jack or white American. The meltyness of cheap cheese can ruin a dish. Recipe calls for DRAINED tomatoes, if you did not drain them, that is probably why is was too thin. Thank you Valentina for the change of cheese suggestion. I find since I quit smoking my taste buds are sensitive to spices, was wondering what other cheese to use instead. Looking forward to making this soon. It calls for Drained NOT undrained Rotel I think you misread the recipe. For anyone who may be looking to lighten this recipe up just a bit, or for anyone following the current Weight Watchers program, a few substitutions will bring a 1/2cup serving down to 4 SmartPoints! That’s it! This recipe is a keeper, for sure! Thank you so much for your feedback! Happy to know that some low-fat substitutions do work 🙂 Especially because I’ve had multiple questions about using Greek yogurt!! Fat doesn’t make you fat. A good pasture raised or organic full fat dairy is good for you. Looks delicious… About how long does it take for everything to melt? Thanks…. I can’t wait to try this!! I’m going to make this for a “taco bar” potluck at work this week…. I’m wondering if it would be okay to keep it on warm for about 4 hours? Would it get too thick? Thank you. Hi Jessica! So when I made this, I did keep it in a slow-cooker for a few hours and it did get thick and the bottom actually started to burn, but the lowest setting on my crockpot is “low.” So if yours has a “keep warm” setting, that would be perfect! If your only option is “low,” I would advise cycling it on and off and stirring it often to keep it liquid without burning. Let me know how that works out for you. Enjoy! Im also doing a potluck at work, but we are using the cheese for a nacho bar. Should i double up on the ingredients or will this be enough for several servings? Hi Roslyn! It depends on how many people you are trying to serve, but personally I took this to work (fed about ~15 people), and then took it home and we had leftovers for DAYS. So unless you’re trying to serve more than 30 people I don’t think you need to double it. Good luck! If you do it on the stove top, I would make sure to constantly hover and keep it on a lower heat. If not, the sour cream will curdle and you will be left with a strange consistency and texture :X Also, make sure it never boils or bubbles o_o I made that mistake it was strange for texture >_< hope this helps. Disappointed it was soupy and grainy I followed the directions except I put mine on high so we could eat it with dinner. I checked it quite a bit but not sure what happened! I will keep looking for a new queso recipe! ???? Hi Nadeya! I’m sorry that happened to you. The directions do state to heat it on low not only to avoid burning but also so that the texture is right. Unfortunately, when using real dairy (as opposed to Velveeta) the ingredients are a bit more high maintenance so high heat will compromise the taste and texture! Can’t wait to make this, I will add chopped cilantro and Lime juice! Thanks for this great recipe! Made this for work. Kept it on warm for 2 hours. Thick, Creamy.and.Gone!! I added 1/4C. Diced cilantro and just before serving, 1/2 lb cooked shrimp(we’ve a kitchen at work). Hi Dee! I am not completely sure but I would say a full batch should be 40-50 small servings. We had leftovers for days! For 120 people I would at least double it! This recipe looks fantastic ! I have made it with velveeta for years! Can’t wait to try this way I have a question – I freeze the velveeta version – have you ever tried freezing this – is it ok? If I make this the day before and refrigerate, will it change the consistency? Hi Ann! I did not have any issues heating it back up, but I did find that adding some milk before heating helped make it more smooth and creamy! This recipe made a lot and we were able to keep heating the queso back up to eat it for probably 2-3 days after I originally made it, just by adding a little milk each time. I made this yesterday for Father’s Day and it was a hit, I tweaked the recipe a little bit though. I felt it lacked in flavor with only one can of rotel so I added a whole jar of salsa and that did the trick, my husband agreed!! It wasn’t white anymore, but it was delicious, and I loved that cleanup was a breeze… it didn’t stick to the inside of my crockpot or anything!! Will definitely make again! I found it extremely bland also. I’ll try adding salsa or an additional can of Rotel next time! It’s a keeper, just needs tweaking! Maybe try to spicy Rotel’s. That has quite a nice kick! Made this for Mother’s Day for a family full of males…now it’s the one thing they’re begging for at our family cookout on the 4th of July! I used 1/2 Monterey Jack & 1/2 Pepperjack last time with salsa on the side for those who wanted more heat…I was thinking of adding some diced (cooked) chicken this time, but then I read the suggestions for adding shrimp…hmmmm…all I know is that whatever I do, this has to be on the appetizer bar! Thanks for helping me make my boys so happy Valentina! Does anyone know how this would hold up if made tonight for a lunch tomorrow, does it warm up well after being chilled? Hi Denise! I did not have any issues heating it back up, but I did find that adding some milk before heating helped make it smooth and creamy! So sounds kinda weird, but for lunch, I would suggest either making it a bit runnier than normal or packing it with some additional milk on top for when you heat it up. Let me know how it works out! Hi just curious how long it takes to melt? Hey y’all! If this has already been asked, I apologize but I scrolled through as many comments as I could without seeing it. Can I used Shredded pepper jack rather than the block? I didn’t think it would make much of a difference but then wondered if it would change the consistency at all? Thanks! Hi Katie! I’m not sure if anyone has tried it. My only concern with using shredded cheese vs the block cheese is that bagged shredded cheese has some extra stuff added in it to keep it from clumping together so it may or may not change the consistency. If you do end up trying it, let us know how it worked out! Can I use Colby jack instead of pepper jack? My husband doesn’t like spicy foods! Thanks. Don’t do like I did and put everything in a slow cooker on low, then just walk away for hours 😛 I forgot to stir it and it all curdled. I also accidentally used “Mexican seasoned rotel”. Everyone loved it but it had a chipotle taste. Everyone still loved it. I can’t wait to try it again with my brain switched on! I don’t know what I did, but this dip tastes like sour cream and cream cheese. Didn’t taste like queso at all. The only thing I left out was the jalapeño. Any advice? Whoops, the left out jalapeño was from the side dish I made at the same time. Got confused, I used the correct ingredients. Hi Krisit! I’m not sure, I do think it may be a personal taste kind of thing. 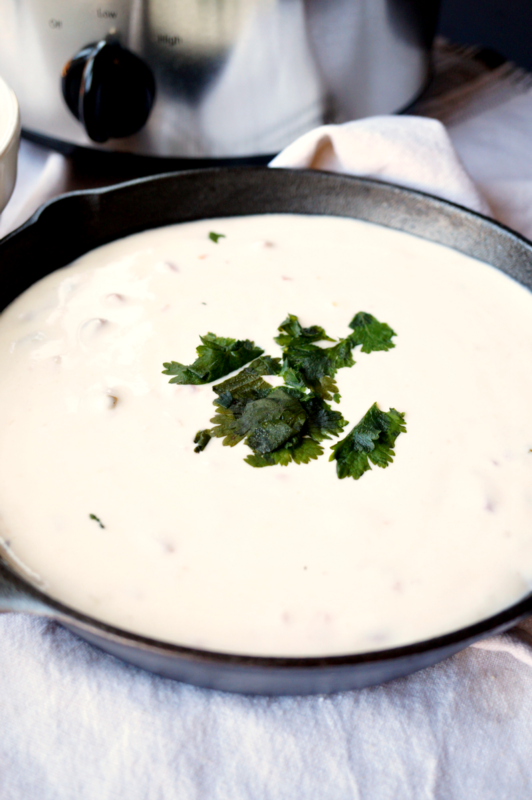 Generally I feel like white queso tastes a bit milder than classic queso! Maybe you can try using a stronger-tasting cheese next time and see if you prefer it. I’m sorry you didn’t enjoy it! Can you use white cheddar in place of pepper jack cheese? Hi Bernice! Yes, you sure can. I have heard that white cheddar actually melts better than pepperjack so it’s a great choice! I’ll try this with Tillamook white cheddar, fresh diced tomatoes and new batch of Hatch green chilies, should be yummy! I am a Velveeta hater also. I am making this tomorrow for the holiday. Sounds really yummy. Can’t wait!!! We don’t allow Velvetta in this house so have been searching for a good queso alternative. Your recipe immediately caught my eye since pepper jack is my favorite cheese. The first time I made it as written and while it was delicious we found it a bit milky for our taste. Plus hubby wanted it hotter. The second time I made it, I omitted the milk and used hot Rotel Tomatoes, undrained. It was just perfect. Have everything for an “as written” batch and really looking forward to it. Thank you! About how many would this recipe serve? I am making food for 250 wedding reception. It says 3 cups which would be about 24 Oz. I was thinking I would need about 100 Oz which is this recipe times 4? Any thoughts or suggestions? Has anyone reheated this? I plan to make, refrigerate and reheat, then keep warm with a sterno. Hi Terri! So I would say this recipe makes somewhere between 30-40 servings. For 250, I would say to make the recipe 5x just to be sure you have enough! I found that this reheats really well, I just added a bit of milk to keep it from being overly thick. To help with the reheating and the large amount you’re making, I would also recommend swapping half of the pepper jack cheese with white American cheese. It melts and reheats really well and it doesn’t get grainy so I think that will help. Let me know how it goes!! Thank you so much! I really appreciate the help and I will let you know. I made this queso tonight for a family get together. Everyone really liked it! These are the tips/suggestions I would give: It took WAY longer than 10 minutes to make. It took mine about 45 minutes in the crockpot to finally melt, so next time I will allow a lot more time. It also was not spicy at all. I also read a comment that said it would make about 50 servings. I made it for a group of about 12 people and it was all gone. That being said, it was very tasty and I’m sure I will make it again! I followed this recipee to the letter and it was absolute perfection. My mini crockpot was slow:I have to start cooking on low a GOOD 45 minutes before I can serve (or longer), but the recipee gets rave reviews. Crowd favorite! Hi Dena! It reheated really well for me. We were able to reheat it for 2-3 days after I originally made it and all I did was add a little bit of milk before microwaving! Quick question. What size can of Rotel? Hi Nicole! You just need a standard can of Rotel which is 10oz! I made this today for a Christmas cookie party, which is also a snack party, LOL, and everyone loved it!! So so so good! People were asking, how is this so light and not heavy like the velvetta kind! I will be making this over and over again! Thanks for this great recipe!! C an I ask about the spices? They aren’t listed in the directions, but are in the ingredient list??? I went ahead and added them…but now it’s orange. Are those supposed to be in the list? Oh, it was delicious. 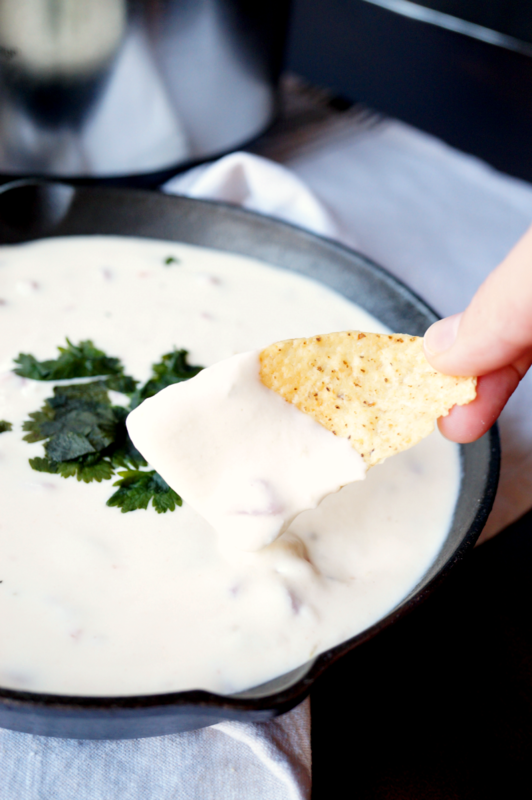 I think if you want it to stay a true queso blanco…just add the garlic and onion powder. 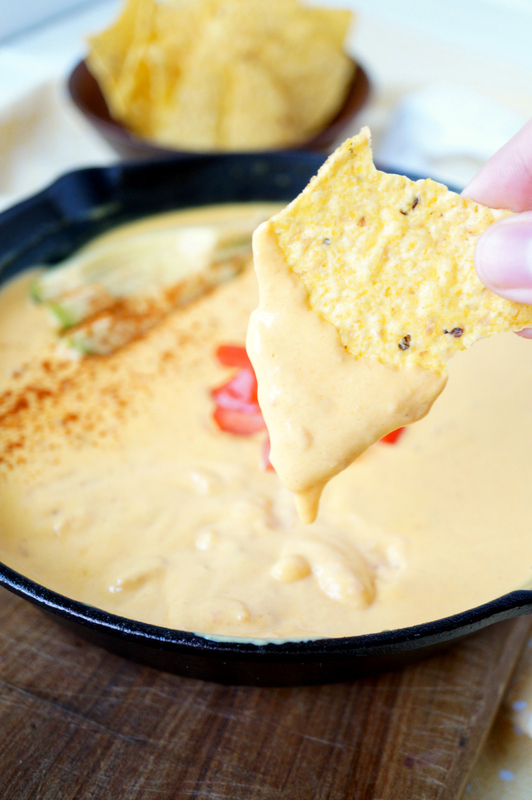 If you want a more traditional orange queso…add it all! I also added fresh anaheim and jalapeno peppers, and fresh chopped cilantro. What size crockpot do you suggest using? Looking forward to making this for our family Christmas! This recipe is great I used 1/2 pepper jack and 1/2 havarti cause the store was out of pepper jack and didn’t have farmers cheese, I didn’t need to add the Milk. My husband loved it. Thank you for sharing. Has anyone added cooked, crumbled sausage to this recipe? This was SO good! I added spinach to mine and it was delicious! Thank you so much for the easy recipe! I made this today and although the consistency after double the amount of time listed was perfect, the taste was off. Perhaps it is because I was looking for a more authentic tasting queso. Many seemed to like it though so I guess it really just depends. 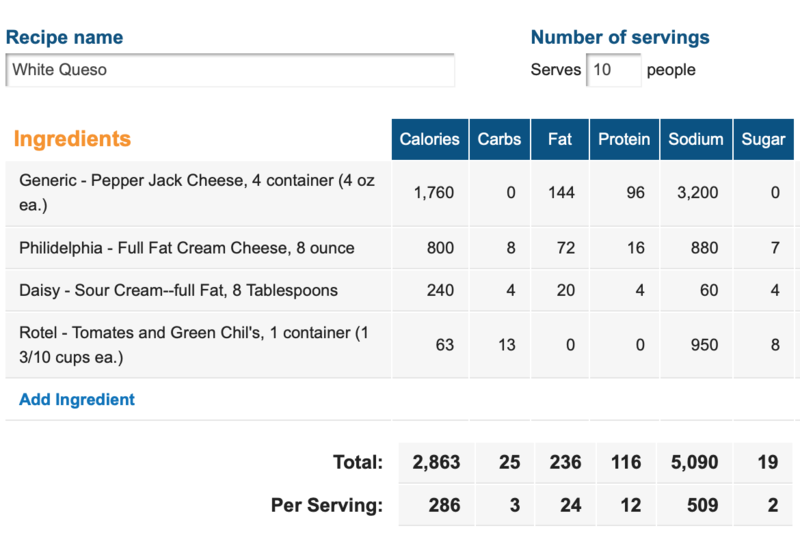 If prepared as directed and split into 10 servings, one serving has 297 calories, 3g carbs, 24g fat, 12g protein. 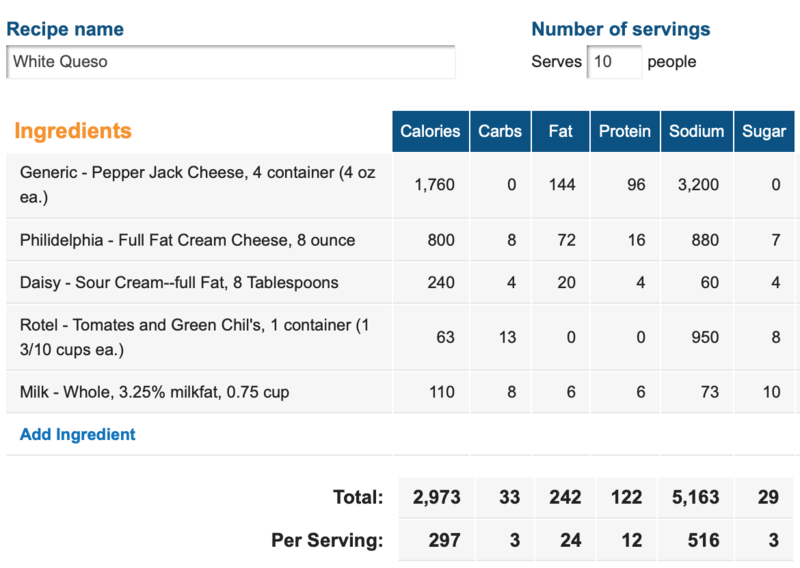 If you substitute heavy cream for the whole milk, you have 358 calories per serving, 4g carbs, 31g fat, 15g protein. You could also omit the milk/cream altogether (some people said they did not need it) which comes out to 286 calories, 3g carbs, 24g fat, 12g protein. Hope this helps! This was amaaaazing! I didn’t use any American cheese and it still came out perfectly smooth and creamy. So delicious and so simple to make! Thank you!! Hi there! 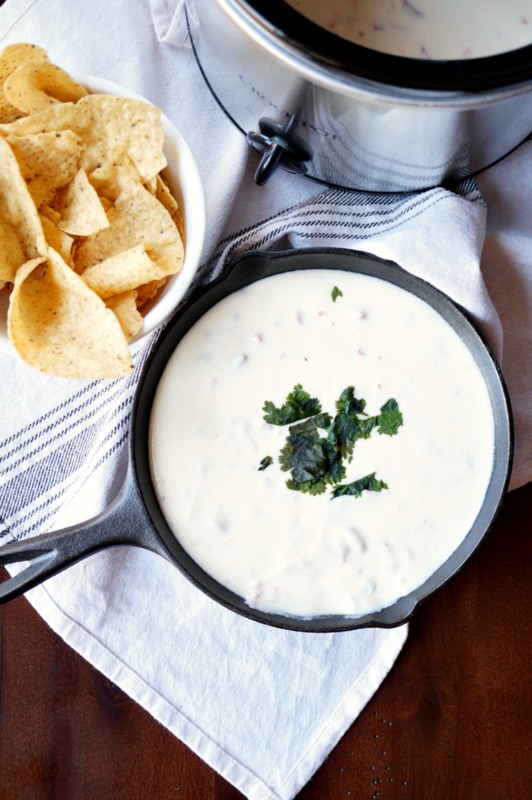 Made this awesome white queso for my coworkers today for a Valentine’s day treat and wow – this is one of the best queso’s I’ve had!! Reminds me of the queso at Charleston’s a little bit. Anyway, thank you so much for sharing this recipe!